Designs for gaming headset range from subtle to obnoxious. The Plantronics RIG 800LX leans to more of the subtle side. It has a very unassuming classic gray and black design that looks slick. I will say it does look quite masculine, going for more hard lines. It’s also a pretty bulky headset. 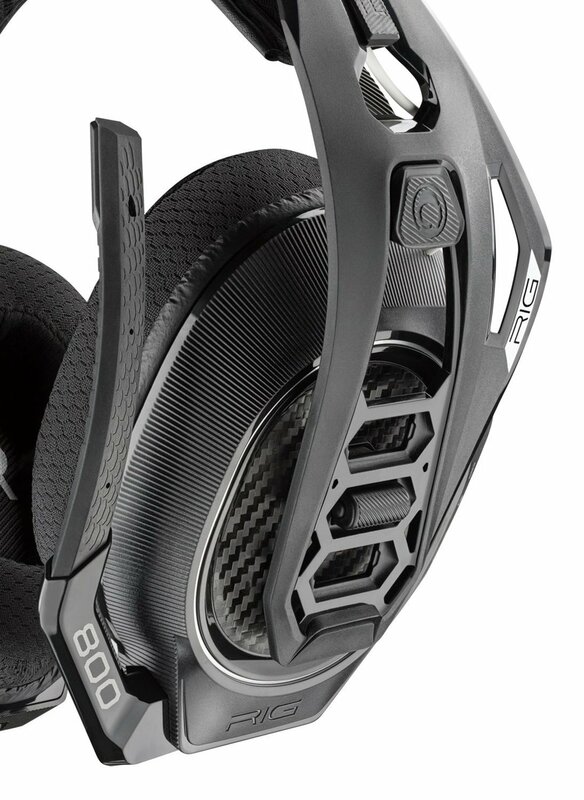 The bulk is increased with the dual headband design that gives some extra support for longer play sessions. The ear cups are some of the larger ones I’ve seen and give plenty of room to cover your ears. The microphone comes down and is of a nice short length and doesn't come directly in contact with your mouth. RIG 800LX is a wireless headset so part of the design is to house a battery. For a wireless headset coming in at 10 ounces is pretty impressive. Plantronics has done a fabulous job of distributing the weight in the headset. I've tested other wireless headsets where it felt almost lopsided. The wireless adapter that comes with the RIG 800LX is a small black box that hooks into your Xbox One or PC via a USB port. If you have a black Xbox One, the small box can blend straight in with your console. When I plugged it into my white Xbox One S, the small box obviously didn't blend that well. Luckily, I upgraded to an Xbox One X and the box blends in and no one has even noticed the small wireless transmitter on top of my console. Plantronics made some really genius decisions with the headset. There are a couple of controls on the left side of the headset. One is to control whether you want to hear more game audio or chat audio, and it works brilliantly. There are an on/off switch and a volume dial as well. After a couple of minutes, I got accustomed to hitting the controls without needing to take the headset off to look for the controls. As I tried to catch up on my massive video game backlog this past holiday, I’ve had a ton of opportunity to put the Plantronics RIG 800LX through its paces. After over a month of testing, this might be the best headset I’ve tested in recent memory. One of the defining features of the Plantronics RIG 800LX is its Dolby Atmos support (a free trial comes with the headset). I’ve tested the headset with and without Dolby Atmos support and once you try Atmos, it’s hard to go without it. The clarity and immersion that comes with Atmos is quite incredible. The setup for Atmos is also super simple and minutes later I was gaming with Atmos and not looking back. The Plantronics RIG 800LX is also incredibly comfortable. As mentioned earlier, its light design is perfectly weighted and even for sessions lasting over five hours, I never got the tired feeling that I have with other wireless headsets. In fact, it was just the opposite. I almost forgot that the headset was even on. The other amazing feature with the RIG 800LX is the battery. The box says that it has 24 hours of battery life and in my real-life experience it actually has far more than that. When the battery finally did run out, I charged it up via USB and it was ready to go. Most important for any headset is audio quality and regardless of the Dolby Atmos support, the RIG 800LX is one of the best sounding headsets I’ve tested. It does a fantastic job of keeping everything crisp and clear regardless of the volume level. This is incredibly impressive. For games that do support Atmos, the experience is elevated to an unbelievable level. 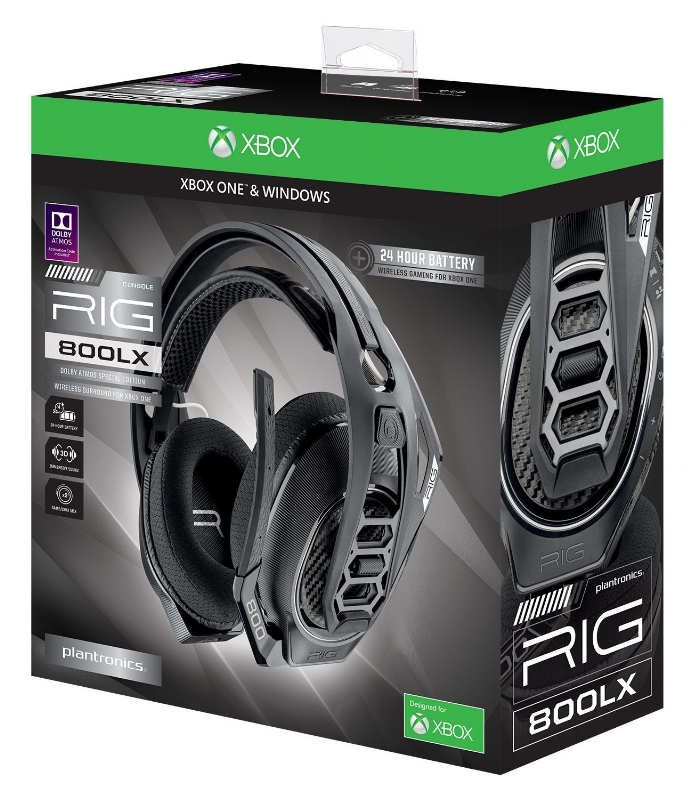 I cannot emphasize this enough, RIG 800XL is an amazing sounding headset. I adore the Plantronics RIG 800LX. My only gripe is that I wish it worked with my Playstation 4 as well. But if you’re in the market for a wireless headset for your Xbox One, I have not tested a better headset then the Plantronics RIG 800LX. It’s easy to setup, it sounds unbelievable, and it’s one of the most comfortable headsets on the market. For the price you get a ton of value and I can’t recommend it enough.